If you’re coming over here from Lauren’s blog, welcome! Well, welcome if you’re coming from anywhere, but she is the “stop” before me on this holiday tour, so that might be how you found me today. 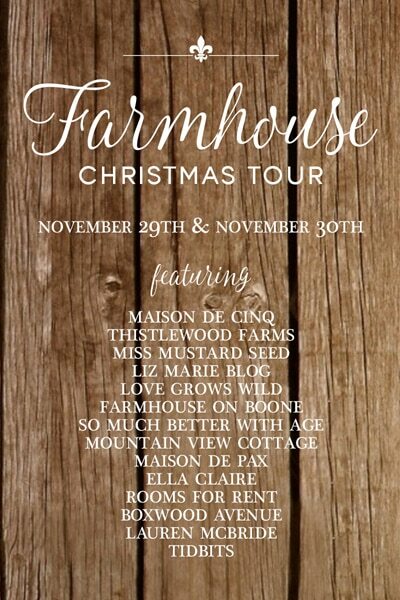 I really wanted to have my entire house ready for this tour, but I just couldn’t pull it together. Not only is a good part of my house still a work in progress (we just moved into it the summer of 2017), but we were having the tile in our foyer done this week and, as I mentioned above, we had a few dozen other things that needed my attention more. So, today, I’m just sharing our living room. It’s the room that got the most Christmas-decorating attention and, while I might tweak a thing or two, it’s the room that is the most finished. The star of the room is definitely the tree. I got it last year when I partnered with Balsam Hill. It’s the 8′ Noble Fir with incandescent lights. Last year, right on the heels of a move, I didn’t have it in me to haul out all of the decorations, so I only hung a fraction of ornaments on the tree. This year, we are more settled and the house is looking more like “us”, so I have been relishing decking the halls. I’ve had my Christmas playlist filling the house and I’m singing as I’m sorting through disorganized bins of decor, trying to figure out how to best dress this house for the holidays. The tree was tucked behind the sofa last year, which never really felt right. It looked like the tree had been sent to the corner for being naughty. It was also a pain to decorate, as I had to literally stand on the back of the sofa to hang some of the ornaments. This year, we tried it next to the doorway and that is the magic spot. I really took my time decorating the tree this year and it’s my favorite tree ever. It’s classy and elegant, but it’s not so perfect that it still feels homey. For the past few years, I have swagged white felt garland around the tree. Last year, though, it looked a little sloppy on this particular tree. I think because this tree is fairly dense, there just wasn’t enough room for the garland to hang. So, this year, I paired the garland with a wired blue/gray velvet ribbon and it’s tucked around the tree, almost in a cascading spiral. It works so much better with the shape of the tree and I like the pairing of the two colors and textures. The ornaments are all blue, white, silver, or natural wood, so there is an overall harmonious color palette. There is a wide array of ornaments, though, from storebought to handmade, from vintage to new, from cheap (plastic balls covered in blue glitter) to higher end (like the Wallace Bells.) And yes, I have even included ornaments my kids made. I don’t feel obligated to use all of them, but I used a few of our favorites that they actually made themselves. It comes lit, which is awesome, but it is lit with LED lights that put off an orangey glow. I used them for a couple of days and then decided to tuck a string of white incandescent lights behind and in the wood village and now it “matches” the lights on the tree. I have learned this year that, aside from the LED candles, I just cannot do LED lights. Not the warm ones, even. If they ever threaten to take away incandescent bulks entirely, I’ll have to hoard a lifetime supply. Anyway, the village tree collar adds the perfect finishing touch around the base of the tree and I love how it works with the skirt I made. To the left of the entry, I added a wool pom-pom wreath (from Anthropologie a few years ago) on the doors of the pine cupboard. This specific dresser is a little big, but I actually like having a piece of furniture there. On the table next to the sofa, I added a small tree (purchased from HomeGoods last year) contained in an antique 2 gallon crock. And I have my usual bowl of mixed nuts with an antique English nutcracker I bought on Etsy a few years ago. My Oma always had a bowl of nuts sitting out, so it reminds me of her. I do actually snack on them, too! I dressed the open shelving with some greens, tealight candles, and Dala horses from World Market. I found the little tealight holders at a yard sale a few years ago. The white flowers were purchased from the dried floral section and I’m not sure exactly what they are! I had them in my “pinecone bin” leftover from last fall. I love how our living room turned out. 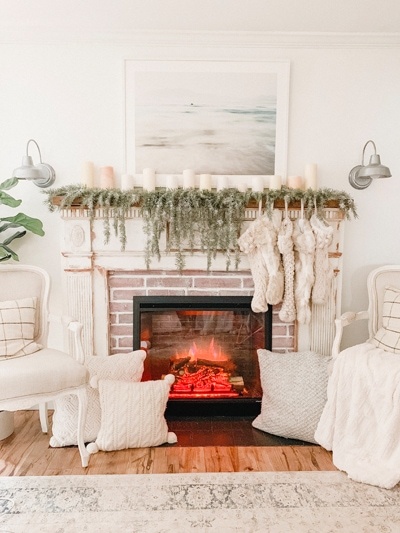 It’s cozy and classic – just the look I wanted for this room for Christmas. Your tree is gorgeous and I agree, it’s my favorite one you’ve had! Really love the ribbon & felt trim together, wood village tree collar, and your mix of old, new, rustic & handmade ornaments & silver bells all together! Like how you simplified the ironstone collection on the bookshelves and added the greenery! The whole room just glows and looks so pretty and cozy ( my favs for any room ). Now if Eulalie were back in her most beautiful gold frame, that would be the (gold) CROWNing touch! I love it. The Dala horses are perfect for your color scheme. The mantel is perfect with your cow painting. Gorgeous. It’s so, so beautiful, Marian. I absolutely love your house and all your vintage pieces. Gorgeous! Oh my. That living room. It’s almost more than my heart can take. The crisp colors combined with the warm textures of wool and felt and wood….it sings! Your eye for detail regarding….well…everything….is why you’re such a success! Merry Christmas from Texas to you! The entire room — perfection!!! It looks very pretty and warm, thank you for sharing. What a wonderful room. Really perfect. LED lights – ugh! We bought all new lights 2 years ago, “warm” LED lights – no they were not. So I went out and bought all new lights again this year – old fashioned warm goldish lights. I know we are not alone in our distaste for the these “blue” warm lights. I have relegated the LED’s to the outside this year, but next year they are going in a garage sale. Like you, if they ever get rid of the “old fashioned” little warm lights, I’ll have to stock up. You did a beautiful job layering decorations on the tree and the room in general. The result is a room that’s festive yet relaxing and very livable. 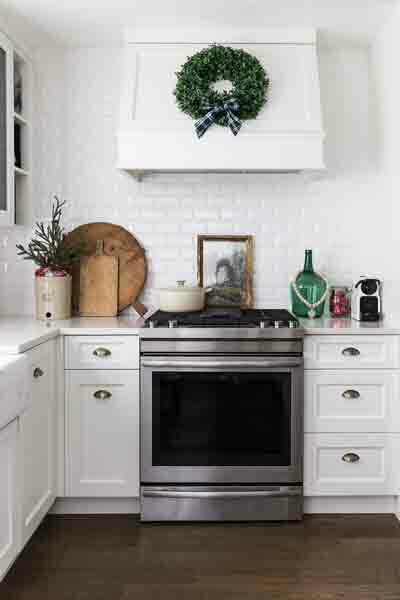 The balance is nicely done, too, with transformative holiday objects dotting the room. I like your tendency to decorate what’s already there, rather than hauling out a roomful of holiday-themed objects. As always, your photos are very professionally done and show your work to good advantage. Sorry last week was such a whirlwind for you. You were right to skip the midweek blog. We can wait. Remember to take care of yourself despite the obligations coming from all directions. Now that you have beautified your house, you deserve to relax and enjoy it. I can relate to your wish for a snowstorm big enough to force everyone to stay home for a few days. From your lips to the ears of Mother Nature. My snow days as a kid were too few and fare between. I have fond memories of donning at least 10 layers of clothing to burrow tunnels into fresh snow banks, all thoughts of school forgotten. It’s the most beautiful tree! Oh my! I love everything in that room! The whole room is just beautiful! Those little tealight holders are so pretty! My parents always had a bowl of nuts & a nutcracker out for the holidays. I think I will start that back up. Cozy and beautiful – thanks for sharing, Marian! Also, L-O-V-E beautiful Miss Morisot and her festive garland! So I just read your tutorial on the pom poms. I learned to make them as a teenager with my mother and sisters, except that we wrapped the yarn around a piece of stiff cardboard. I may have to make a bunch! Also, I didn’t know that your family had Siamese cats when you were a child! I love cats! But Siamese cats and black cats are tied for first place in my heart! What a beautiful tree!! Could you please, describe in what order you decorated the tree? Lights? Ornaments? Garland? and Ribbon? What order did you put them on? 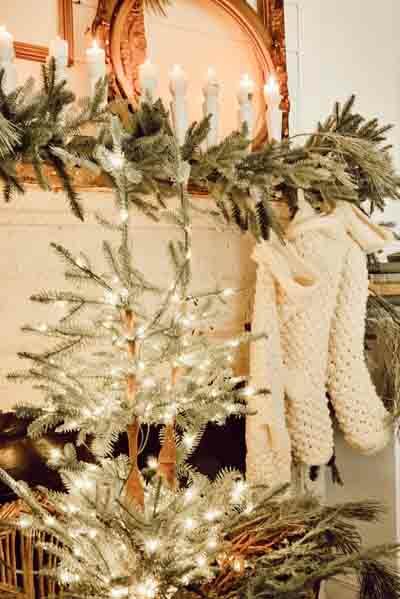 I’ve never added ribbon or garland to my tree so I would like to learn how you did it? Was the ribbon long lengths and you tucked in at certain spots? How do you know how much ribbon length to use? I also love the look of your dense Christmas tree…. definitely something I’d like to try to do myself. Enjoy your cozy weekend!! It looks beautiful! My maternal grandmother and then my mother always had a bowl of nuts during the holidays too and I have also carried on that tradition. I just can’t stop–I eat mine too! My house is 98% decorated. I want to tweak a few things and then start wrapping presents. Beautiful! Where is Sebastian’s stocking? The whole thing is just absolutely beautiful! Marian your home is just breathtaking!! I have loved watching you take this “builder grade home” and make it so incredibly special! It was so wonderful to join in on the tour with you!! You are always such an inspiration!!! love the colors of your tree soo soo pretty! Do you do all of your decorating yourself? I was just wondering if your sons get to help decorate the tree? It looks professional and perfect! Love the tour, and your tree Marian! I love the size of it, and the collar is so “you”! I think the room is, indeed, cozy and classic, so you described it perfectly. Thank you so much for joining us on the tour today – it was wonderful to have you! Thank you for sharing Marian. 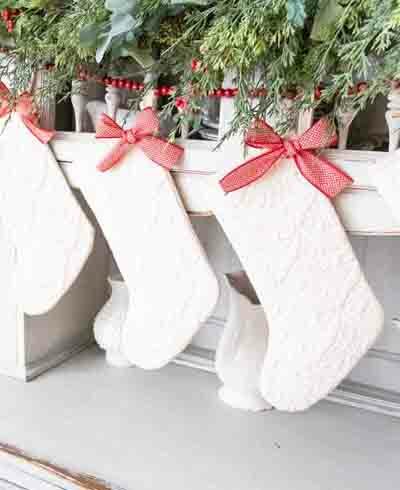 I love the grey ribbon on your tree – absolutely gorgeous with the cream garland. Beautiful! Love all the Ironstone, the chippy table behind the sofa, and that gorgeous cow! I love every room I get a glimpse of that you decorate! What is the gorgeous color on the walls. 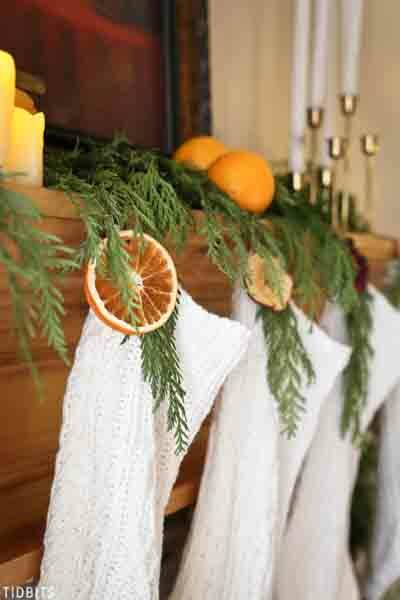 Such a soothing backdrop for your Vhristmas decor!